Manufacturer of propane and natural gas hose assemblies, quick disconnects, convenience connections and regulators. US based (MO). distributor of ostrich, pheasant, peacock and marabou feathers. Specializing in wedding and engagement photography as well as portraiture. Features sample galleries, information about a guarantee and free guides. Based in Sturgis. Information about new and used Harley-Davidson motorcycle sales, service, and rentals in the Black Hills of South Dakota. Local Harley Davidson franchise. Rally pictures, schedule, online sales. Harley-Davidson rentals and sales of used Harley-Davidson motorcycles. Also information on tours and rallies including Daytona Bike Week and the Sturgis motorcycle rally. Includes bikes, gifts and apparel, headwear, and jewelry. Design and manufacture of custom wheels and belt pulleys for Harley-Davidsons and other bikes. Featuring traditional and flavored pretzels. Includes history, teachers page, and puzzles. Available videos of Sturgis, Black Hills Classic, Daytona Bikeweek, Laconia, Myrtle Beach Rally,and Biketoberfest. Products from South Dakota including Dr. Willards water, door stops, sturgis beef jerky, piano CDs, and gate closers. Custom billet wheels, and aluminum frames, including Sturgis, Weld Racing, and GN products. Products, photos, apparel, and kits. RV and tent camping for the Sturgis Rally. Located 15 miles South of Sturgis. Serving breakfast and supper to our guests daily. Hosting mature adults, 21 and over. RV hookups and tent camping with hot showers. Close to Sturgis for Sturgis Rally Camping. Detailed list of the services offered, contact information, and office hours. Lots of information about the Sturgis rally. Tons of pictures from past events. Private course in Sturgis with a clubhouse and pro shop. Course details and statistics, history, and pictures. Includes program information, calendar, meeting times, committee notes, and contacts. Located 6 miles from Sturgis. Provides area map, links and contact information. Twenty acres of grass tent camping. Facilities for the largest campers. Sites will fit 40-50 foot pull through with 50 amp breakers. Provides Sturgis rally information, pictures and rates. Offers RV and tent sites, and cabins. Includes amenities, photos, rates, area attractions and reservation form. Located in Sturgis. Includes program information, troop profiles, leadership contacts, events and calendar. Elaine from Sturgis, Mississippi celebrates her 1968 BMW R50 motorcycle restoration. Classic BMW info & links. Founders of the Sturgis Motorcycle Classic, also known as the Black Hills Motor Classic. With history, schedule and guestbook. Sturgis Rally Campground for RV, Tents and Cabins. Hourly Shuttle, Swimming Pool and Jucuzzis. Provides amenities, rates and services. 33 Katmandu RV Park and Campground Sturgis, SD. Cabins, 31 acres of camping, flush toilets, laundry, phones, private showers, food court, bike wash, and shuttlebus. Offering large RV sites with amenities, cabins, laundry room, restaurant, bar with pool tables, free shuttlebus. Includes rally rates, reservation form, FAQs, photos, map and distances. Located 2 miles from Sturgis. Offers 25 acres of shaded camping, picnic tables, showers, flush toilets, RV dump station, cabins and general store. Includes map, rates, photos, rally dates and contact form. Located 2 miles east of Sturgis. Biker bars located in Sturgis and Daytona. New location in Laconia is under construction. Greeting from the Pastor,list of local leaders, list of beliefs. Jerrys Harley Davidson Motorcycle and Pictures of Sturgis, Bean Blossom, 95th Reunion, and many other events. a profile of the department and its officers. Full service campground near downtown Sturgis, SD. Features information on camping, concerts, entertainment, and reservations. 51 wmsh sturgis 1230 am. SiteBook Sturgis City Portrait of Sturgis in Missisippi. 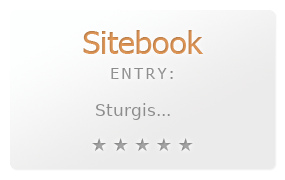 This Topic site Sturgis got a rating of 3 SiteBook.org Points according to the views of this profile site.